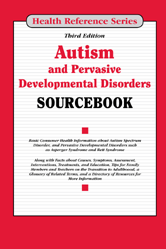 Provides basic consumer health information about the causes, risk factors, symptoms, and diagnosis of autism spectrum disorders and related conditions, along with facts about interventions and treatments, educational guidelines, and coping tips for families. Includes index, glossary, and other resources. Chapter 1—What Are ASD and Autistic Disorder? Chapter 15—How Is ASD Diagnosed?